One of the prominent tourist spots of Hyderabad, Necklace Road presents a fun filled yet calm environment to spend some relaxed moments. Built in the same way as the Queen’s Necklace of Mumbai, the Necklace Road of Hyderabad also resembles a necklace. Stretched across a length of three-kilometre, Necklace Road connects three major parks of the city, namely NTR Gardens, Lumbini Park and Sanjeevaiah Park. 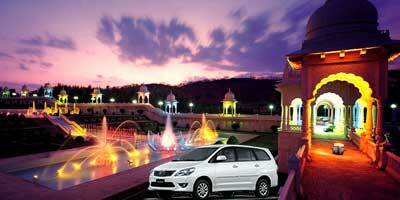 The road runs from NTR Gardens and Lumbini Park in Hyderabad to Sanjeevaiah Park in Secunderabad. And from Sanjeevaiah Park it runs to the Tank Bund Road which is later connected to the NTR Gardens. This gives it a shape of a necklace. Although popular as Lover Park, Sanjeevaiah Park presents a perfect hangout not only for couples but also for families. Its lush green surrounding offers a perfect break from the hustle bustle of the city. Its rose garden along with amazing rock sculptures captivates everyone. Lumbini Park, is another popular hangout spot for hyderabadis. There are some rides for kids as well as shop by the lake side for a quick shopping. The view of the lake from the park is just mesmerising, making it an ideal place to sit and enjoy the natural scenic beauty. This necklace road is bejewelled with a wide array of recreational activities along with umpteen numbers of restaurants and eat-outs. You will also find many stalls of ice cream, tea and other snacks. There are stalls of balloons and toys to for kids. The stretch of lush green lawns acts as perfect area where people can be seen sitting out with kids and families. This place offers its visitors with various interesting options. One of the most popular of all is boating at the lake. There are two boarding points - one at Necklace road and another at Lumbini Park. 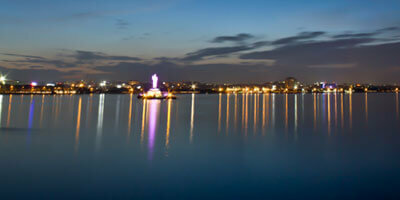 The lighting show at the standing statue of Buddha in the middle of the Hussain Sagar Lake can be enjoyed while boating. The lighted Buddha statue and the view of lake, especially in night and early morning makes for an awesome photography venue too. Apart from boating, another attraction here at the Necklace road is the water park. 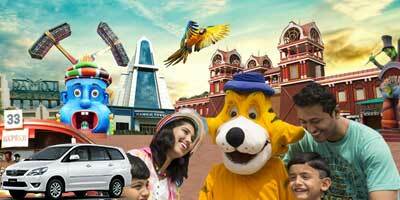 Jalvihar, located right next to the eat street is a family amusement park, solely offering water games and slides. This place can be clubbed with a visit to the necklace road. One can spend time here playing games which can be followed with a refreshing boating experience at the lake and relaxation at the park around the necklace around. The Eat Street at the road offers you not just delicious snacks to munch on but also a range of different cuisine to taste. If you are looking for a place for a fine dining experience, then there is a waterfront restaurant at the necklace road as well. The view of the lake from Necklace road, especially in the evening, is worth capturing. Visit Necklace road for some relaxed moments with your loved ones. Parks at the necklace road are best! I went to lumbini park, it is quite nice, I went with my family so had good time there with everyone, kids had enough place to play and we had good long walks. In fact, even the walk by the side of parks around the necklace road is very nice, you can see Hussain Sagar lake and the Buddha statue. had a peaceful walk. Necklace road has been our meeting point since college days. So again we went there recently. It was around 5 pm when we reached necklace road. The place is still so beautiful. So clean and serene. Hussain sagar lake not only stinks and was dirty in the corners. There is Prasad I max also near by, so we went for a night show after an awesome evening at necklace road. Overall had a good time. Necklace road is one of the most popular places to visit in Hyderabad. I went there last time on my Hyderabad tour. It is said that it resembles a necklace, hence the name. Although aerial view was impossible so had to believe what I was told! But still the place is quite good, it's happening in a different way. So many people, so many different things to do and everyone seemed to be enjoying. There is place to sit or try out activities, eateries too. 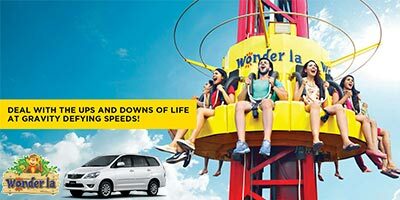 there is a water park too at the necklace road. Necklace road is refreshing. Go in night, it is beautiful then. There will be food stalls, small ice cream sellers and chats and all, in fact a complete eat street at necklace road. Along with this, cold breeze, greenery of park and beautiful Hussain Sagar lake. It is full of natural beauty. Lake is little dirty but apart from that everything else was awesome. We often go to necklace road. It is usually crowded in evenings, there will be people at eat street and even parks at necklace road are also crowded so go in morning. It is peaceful then. We usually park our car and then go for long walks, it is so refreshing. Lake also looks more peaceful and calm. The view of sunrise is just awesome. Perfect start of our day. Necklace road connects many sightseeing places in Hyderabad. 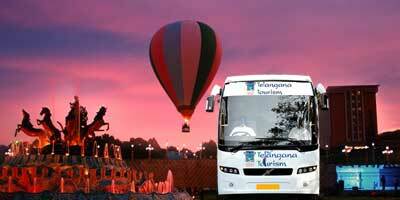 NTR Gardens, Imax Prasads, Snow world, Lumbini Park, Hussain Sagar lake, sanjeevaiah park. Everything is close to this road. There are many restaurants as well at necklace road, even a water park Jalvihar too. Good place to go and cover many places on a single visit.